The prescription blood pressure drug Benicar, which is manufactured by Daiichi Sankyo and Forest Laboratories, is increasingly linked to sprue-like enteropathy, a side effects that causes painful and chronic digestive issues akin to Celiac’s disease. Patients suffering adverse symptoms while taking Benicar report diarrhea and extreme weight loss. Moreover, a recent study of the side effects of Benicar revealed that its symptoms could be fatal in certain patients. The sudden onset of these symptoms absent proper warning by the drug maker has resulted in the emergence of a growing number of Benicar lawsuits across the United States. Sprue-like enteropathy is a potentially-deadly condition occurring in the intestinal tract. Its symptoms mimic those of Celiac’s disease – a condition caused by an allergy to wheat and gluten. Nearly all patients suffering from sprue-like enteropathy report perpetual diarrhea and uncontrollable weight loss. Many patients enduring these symptoms require hospitalization and suffer an increased risk of dehydration. Following a recent Mayo Clinic study of patients taking Benicar, researchers uncovered large percentages of test subjects suffering from mucosal inflammation, gastritis, colitis and other significant bowel issues. Unlike patients with true Celiac’s disease, Benicar test subjects did not benefit from the introduction of a gluten-free diet. Treatment of sprue-like enteropathy generally involves monitoring the patient and maintaining electrolyte and hydration levels. Patients are also monitored to ensure a return to a healthy weight. Fortunately, this condition is usually treatable and reversible once the underlying cause is identified. For patients taking Benicar, significant numbers experience relief after cessation of the drug. The results of the aforementioned study, as published in the Journal of Pharmacy Practice, reveal a strong likelihood of a connection between the active ingredient in Benicar – Olmesartan – and the resulting effects of sprue-like enteropathy. During the study, researchers at the Mayo Clinic compiled 22 individuals currently prescribed Benicar for high blood pressure. These individuals were also believed to be suffering from Celiac’s Disease and presented with many of the symptoms listed above. The median age of test subjects was 69.5 years. The patients reportedly suffered from the effects of chronic diarrhea for a median period of 19.2 months and lost a median of 39.6 pounds before ceasing the drug. Interestingly, the amount of time each patient was taking Benicar prior to the onset of symptoms ranged from six months to seven years. All 22 patients were taking 40mg of Benicar for the treatment of their blood pressure, however 64 percent of the test subjects were recently hospitalized for extreme weight loss averaging 18kg or more. The patients were given intestinal biopsies and closely monitored as Benicar use was suspended. Many patients showed an immediate response and an average weight gain of 12kg was reported. As well, of the 18 patients who submitted to a follow-up biopsy, all showed intestinal improvement after stopping Benicar. 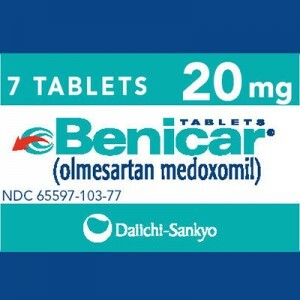 Benicar is one of the top-selling drugs to treat hypertension. It was approved by the FDA for consumer use in 2002 and has since been prescribed to millions of Americans. In 2012 alone, 10.8 million prescriptions for Benicar were filled by patients undergoing treatment for hypertension. Benicar side effects are not limited to sprue-like enteropathy. In fact, many patients report additional complications. Due to the identical nature of sprue-like enteropathy to those symptoms associated with Celiac’s disease, patients often go misdiagnosed for months before a prior identification of the issue is made. It is not uncommon for patients to lose more than 30 pounds while taking Benicar, many of which require immediate hospitalization. The Food and Drug Administration has recently identified the problems possibly associated with Benicar and approved changes to the warning label affixed to the drug. In July, 2013, the FDA cited the extreme possible side effects of Benicar and encouraged patients to immediately discontinue use if similar effects occur. It further warned that the effects of Benicar may not appear immediately, as some patients did not experience adverse symptoms for months or years after starting the drug. The FDA’s warnings came in response to the Mayo Clinic’s study, as well as dozens of other reports and complaints lodged by patients. According to its Adverse Event Reporting System, of all Benicar patients reporting intestinal villous atrophy on biopsy, all experienced improvement upon cessation of Benicar. As well, a recurrence of symptoms was documented in ten of the 23 reported cases upon reintroduction of the drug. The FDA further identified several comparable blood pressure medications, known as angiotensin II receptor blockers, and revealed that similar diarrhea and weight loss has not been reported in conjunction with any other type of ARB medication. To date, Benicar has not been recalled by the FDA or the manufacturer. Litigation related to Benicar side effects has started to emerge as patients seek money damages following their experience with the drug. Litigation pending in New Jersey district court represents a small fraction of the potential number of claims against Forrest Laboratories and Daiichi Sankyo. Sufferers of sprue-like entereopathy are expected to make claims for medical expenses, lost wages, pain and suffering, and more.